The Primate of All Ireland paid tribute to the Columban missionaries last weekend in Armagh Cathedral highlighting the Society’s dedication to bringing the Good News to the poor, the downtrodden and the marginalised. 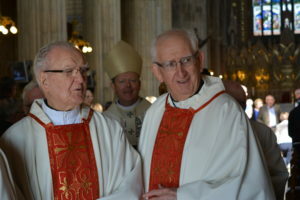 Speaking at the start of Mass on Sunday morning in St Patrick’s, Archbishop Eamon Martin said they had worked for justice and peace, witnessed against oppression, stood up for human dignity – often putting themselves in danger by doing so. “Today, Columban missionaries are at the forefront of teaching about reconciliation and justice, caring for the earth, our common home, and pointing out how the poorest peoples of the world suffer most from the throwaway culture of greed and waste,” he said. 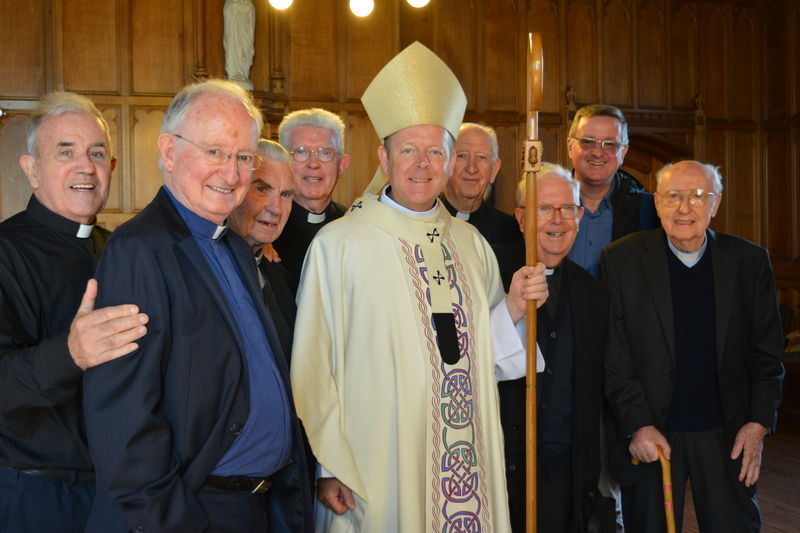 Columbans from Dalgan Park concelebrated the Mass with Archbishop Martin which gave thanks for the men from the towns and countryside of the Archdiocese of Armagh who heard God’s call to become Columban priests. Recalling that the motto of St Columbanus was “Christi simus non nostri – Let us live for Christ and not for ourselves”, Archbishop Martin said this is exactly what Columbans from the Archdiocese of Armagh did, by leaving their native counties of Armagh, Louth, Tyrone and Derry to bring the message of God’s love to the ends of the earth. 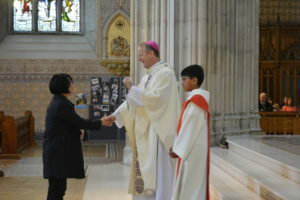 The Archbishop himself recalled his own family link with the missionary society. “In a personal way I also add the name of my own cousin, Fr Eddie McColgan, a Columban priest from Iskaheen in Co Donegal, who ministered for 45 years on the island of Fiji. Archbishop Martin paid tribute to the 24 Columban missionaries who had laid down their lives from Christ over the past century. He also recalled how on 8 September 1916, a young Cork priest, Fr Edward Galvin, left a meeting with Cardinal Logue of Armagh, delighted to have received his support for the foundation of an Irish Missionary Society for China. A month later, the Irish bishops formally backed the proposal, saying they were thankful to God “for this new and striking evidence of the continued life of the ancient Irish missionary spirit”. With the help of Fr John Blowick, a professor of moral theology at Maynooth, and several others, people from all over Ireland joined together to raise the funds for the Maynooth Mission to China. The first new missionaries arrived in China in 1920, with people speaking of “a million souls in China to be won for Christ”. But others, including Fr Galvin, the co-founder, thought at times it was “a bit of a mad thing to do”… and this is now the title of Fr Neil Collins’ recent history of the Columbans. 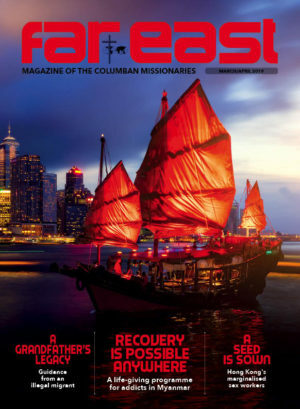 “God’s grace blessed their efforts – the Columban missions in China continued until they were expelled in the early 1950s. By then, the Columban Sisters had been founded, and new missions opened in the Philippines, Korea, Burma and Japan,” the Archbishop recalled. 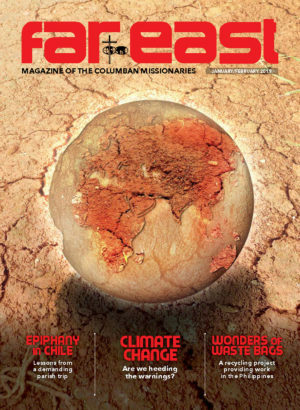 Eventually Columban missionaries – priests, religious and lay women and men – would travel to Latin America, Australia, Fiji, Pakistan and Taiwan, Brazil, Jamaica and Belize and Myanmar. There were other Ephphatha moments in the parishes where I worked in the Philippines, he said as he recalled working in San Pablo, which had a population of around 40,000, some of whom lived in the town but most were scattered over 47 villages, each with its own chapel. 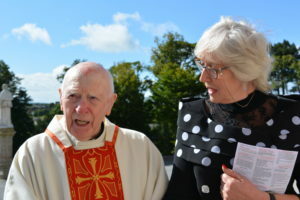 “I was the only priest,” Fr Neil explained. 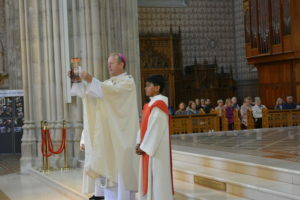 He challenged the faithful to recognise Ephphatha moments in their lives. 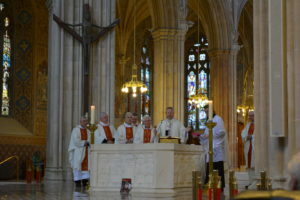 Archbishop Martin noted that no one had ever said that being a disciple of Jesus was easy, and he highlighted how Pope Francis had drawn attention to St Columbanus, the patron saint of the Columbans, in two of his addresses during his recent visit to Ireland. “I think of St Columbanus, who with his small band of companions brought the light of the Gospel to the lands of Europe in an age of darkness and cultural dissolution … It was their daily witness of fidelity to Christ and to each other that won hearts yearning for a word of grace and helped give birth to the culture of Europe … Of course, there will always be people who resist the Good News, who ‘murmur’ at its ‘hard words’. Yet like St Columbanus and his companions, who faced icy waters and stormy seas to follow Jesus, may we never be swayed or discouraged by the icy stare of indifference or the stormy winds of hostility,” the Pope said.